Perfectly Pamela: What have we been up to? 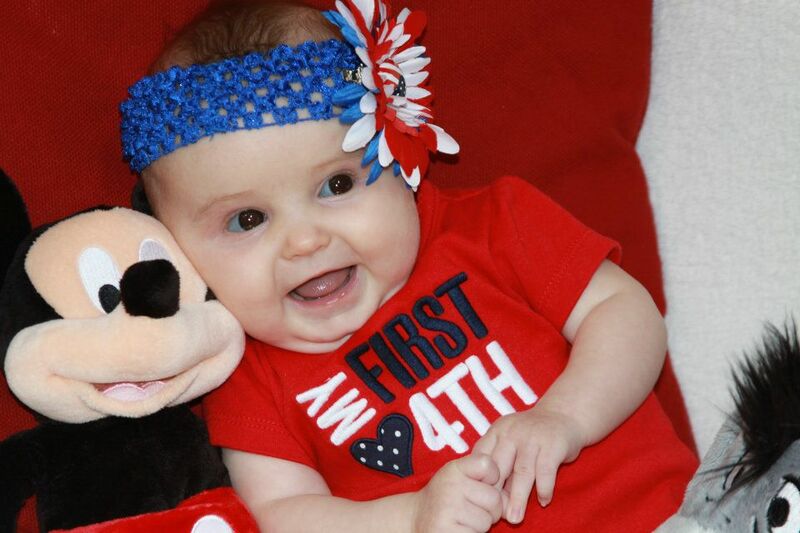 Which means obviously I had to dress Kayleigh up for 4th of July this year and take a bunch of pictures. Her grandpa bought her a onesie that said "My First 4th" and I paired that with a super cute headband that had a red, white, and blue flower with a flag on it. Then I posed her on the couch with Mickey Mouse for the obligatory photo shoot! Kayleigh is smiling and laughing so much these days but it's always been hard to catch on camera. That is when we employ the fart noises tactic and it gets her smiling every time! I absolutely love that she has Eeyore's ear in this photo because it is a perfect depiction of her right now. Grab whatever is closest and try to put it in her mouth. And one more smiley for good measure! I can't get enough of that sweet face! My final photo note is about Kayleigh's swimming pool. We decided that she needed to get used to being in the water and with the weather hitting over 100 degrees every day we thought a baby pool would be a great option (especially since she is still too small for real swimming pools and swim diapers). And in the end I think Drew liked it more than she did. But check out that sweet slide and the dragon head that shoots out water!